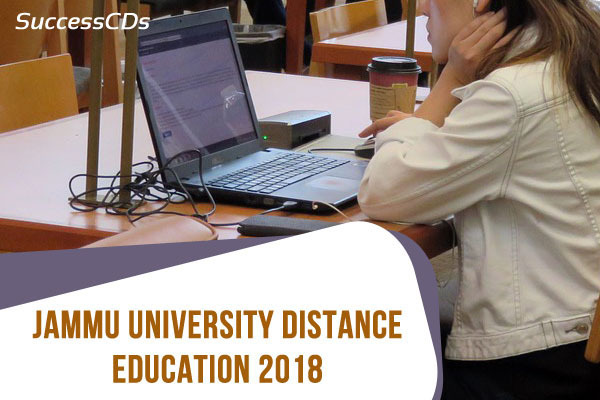 Jammu University BA, B.Com Distance Education Admission 2018- Online applications on the prescribed format are invited from the eligible candidates for admission to the Undergraduate Programs i.e. B.A. /B.Com. Sem.-I through the Directorate of Distance Education, University of Jammu and its Learners Support Centres Constituted at Govt. Degree College Kathua, Udhampur, Poonch, Rajouri, Doda, Bhaderwah and Kishtwar for the academic session 2018-19. Candidates who have passed the B.A. Part-I examination of the University of Jammu or any other examination recognized as equivalent thereto by the University of Jammu shall be eligible for admission to B.A. Part-II. Candidates who have passed B. Com Part-I examination of the University of Jammu or any other examination recognized as equivalent thereto by the University of Jammu shall be eligible for admission to B. Com. Part II. Candidate who is placed as reappear in one subject in B.A./B.Com. Part I examination shall also be eligible to seek provisional admission to the next higher class at his/her own risk and responsibility. The candidate has to submit an affidavit duly attested by Notary as per specimen given in Annexure (III) of the Admission Form. The candidate has to clear the subject in which he/she has been placed under reappear category failing which his/her provisional admission to the next higher class shall stand cancelled. Candidates who have passed B.A./B.Com Part-II examination of the University of Jammu or any other examination recognized as equivalent thereto by the University of Jammu shall be eligible for admission to Three-Year Degree (General) Course B.A./B.Com. Part-III. The candidate has to submit an affidavit duly attested by Notary as per specimen given in Annexure (III) of the Admission Form. The candidate has to clear the subject in which he/she has been placed under reappear category failing which his/her provisional admission to the next higher class shall stand cancelled.